As WhoWhatWhy readers know, we don’t consider this a quaint item of obscure historical interest. We’ve reported on several different angles, including a curious angle involving Bush, Blair, oil in Iraq, and oil in India. And then there was George W. Bush’s own personal obsession with finding a reason to invade. …In March 2003, just before Britain went to war, Shell denounced reports that it had held talks with Downing Street about Iraqi oil as “highly inaccurate”. BP denied that it had any “strategic interest” in Iraq, while Tony Blair described “the oil conspiracy theory” as “the most absurd”. Last week, Iraq raised its oil output to the highest level for almost decade, 2.7 million barrels a day – seen as especially important at the moment given the regional volatility and loss of Libyan output. 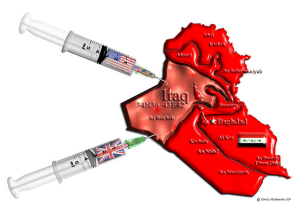 Many opponents of the war suspected that one of Washington’s main ambitions in invading Iraq was to secure a cheap and plentiful source of oil…. Have you heard this being discussed by the major media? Calls for investigation on Capitol Hill? Or deafening silence? As noted above, in February, 2003, Tony Blair called speculation that oil was behind the invasion “conspiracy theory.” If so, conspiracy theory is looking pretty good these days.